Funny books aren't always funny. They are capable of fully exploring the human condition, including the heights of selfless love and the depths of war. Bill Mauldin became the most famous cartoonists of his generation by recording his first-hand experiences of the bone-weary drudgery and horror of World War II. He continued his long and illustrious career as an editorial cartoonist, and humor was rarely his focus unless one includes the black sub-genre of haha. Bill Mauldin's Army is a huge collection of his war cartoons from boot camp, through the fighting in Sicily and Germany, and to de-mobilization as hundred of thousands of soldiers returned home. It is bluntly, painfully honest. Glory is even more rare than haha as his two most famous soldiers, Willie and Joe, trudge through the mud and stench of war. Mauldin's heavy line, flawless composition, attention to human expression, the environment, and his unromantic treatment of misery is perfect for his single-panel cartoons. His use of pen and grease-pencil is distinctive and powerful. Mauldin's dialog is brutally real as his soldiers battle hunger, thirst, dirt, disease, the weather, loneliness, fear and Germans. It is difficult to tell which was the greatest threat; you may suspect the unrelenting toil of just staying alive when it seems that everything is conspiring to kill you. 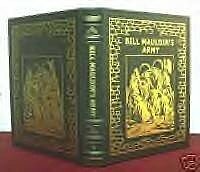 Bill Mauldin's Army/383 pgs., William Sloane Associates, original publication, 1951/available at on-line and storefront used bookstores and at on-line auctions. Bill Mauldin is a member of the Oklahoma Cartoonists Collection. Order Vance's history of the American Comics Group in Alter Ego #61 at www.twomorrows.com. Shudder at Michael Vance's "Light's End" audiotapes narrated by legendary actor William Windom. Star of 18 Broadway plays, 200 TV shows (Murder She Wrote, Star Trek, etc) & 50 movies, Windom will chill you as Vance's prose curdles your blood! Light's End #1: "A Change of Heart" and "Cross Purposes" or #2: "Fall Guy" and "The Zoo" plus the song "The World Roars On". $10 unsigned. $20 signed by Windom and Vance. Cassette or CD from: Vance, 1427 S. Delaware Ave., Tulsa, OK, 74104, or www.starbase21OK.com!